Algeria’s instability claimed another self-immolation victim, Rechak Hamza, on April 29. Hamza set himself on fire in Jijel, in eastern Algeria, suffering third-degree burns. He was airlifted to a hospital in Constantine before succumbing to his injuries. His funeral was held on May 2.Hamza was a 25-year old cigarette vendor working in the densely populated Moussa Village district of Jijel. He committed his desperate act following an altercation with local police, who forced him to dismantle his stand and only means of livelihood. For local residents, it was yet another instance of hogra — an Algerian term for the “contempt” of the ruled by the rulers. Hogra arrogantly condones the violence of a selected few against the many. Violent protests broke out in Jijel once the news broke of Hamza’s death in Constantine. Police attempted to barricade Moussa Village to contain angry crowds of 1,000 or more people as youths marched on the provincial capital. Tensions in Jijel remain high, and a police inquiry into the incident is underway. Algeria has seen hundreds of such self-immolations this year, including at least 60 in the coastal city of Doran alone. Yet unlike in neighboring Tunisia, these sparks have yet to set Algeria aflame. Many Algerians feel that the country already had its “Arab Spring” when Islamists won the first round of the national elections in 1991, leading to a fierce state crackdown and a civil war. It’s not likely that the parliamentary elections on May 10 will resolve the deep divisions in Algerian society. Even before the announcement of the official results, the Islamist coalition began accusing the authories of election fraud. The Islamists are shown to be coming in a distant third, behind two pro-government parties. El Watan and other independent newspapers, citing country-wide disaffection, have expressed skepticism over the governmen’t final voter turn-out count. The final report from international election monitors is not expected before July. Algerians may not wait that long before resuming their protests. 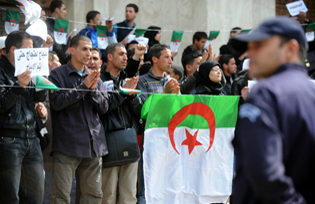 The National Liberation Front (FLN) has ruled Algeria since 1962, surviving the massive riots in 1988, a decade-long civil war in the 1990s, and more recently the wave of revolutions in the region. Following an outbreak of protests in Algeria’s major cities last year, the government instituted a handful of unimpressive reforms, including a call for parliamentary elections on May 10. Algerians may have other things on their minds. The prices of consumer goods have steadily increased since late February, leading many to accuse the government of manipulating food prices ahead of the general elections. The use of food prices for political leverage is not new in Algeria; analysts seem to be of two minds about their precise utility. The first camp believes that the government covertly drives food prices up by controlling the amount of produce available in the market, then exploiting the rising prices as an electoral issue. Another school of thought is that rising food prices create a distraction for citizens, leading them to abstain from the political process (and the opposition) by forcing them to worry about le pain quotidien instead of politics. The opaqueness, corruption, and straightforward hogra of those in power make it difficult to fully unravel the level of political manipulation in food prices. But the basic fact remains that Algerian citizens end up footing the bill when the economy is used in the political struggle to maintain power. Abdelaziz Belkhadem, the secretary general of the FLN and personal representative of President Bouteflika since 2008, perfectly exemplifies the hogra in Algeria. Belkhadem is part of a rotating cast of elites in President Bouteflika’s cabinet who reshuffle themselves among ministries and roles to give the illusion of change. Belkhadem said in a conference on May 1 in the city of Boumerdes that the “multiparty and democratic system has not responded to the aspirations of the Algerian people,” citing the failure of political parties created since the “opening” of the political field in the late 1980s to create any alternative programs or offer social solutions. He continued by accusing certain parties in the opposition of promoting a false platform and unattainable reforms. Algeria’s current political system, which is entirely dominated by the FLN, allows almost no room for any type of genuine democratic practice. Belkhadem’s comment, a disingenuous broadside from one of the country’s privileged elites, exemplifies how far the leadership has strayed from the masses. Belkhadem’s suggestion that the FLN — the self-described “party of the mujahideen” — is the only party that cares about the interests of the nation is insulting to those who have witnessed the ongoing suppression of genuine popular appeals. Despite the “opening” of the political field and the broader regional upheavals, censorship on information in Algeria continues, so most of the population is forced to get domestic news from foreign new sources. ENTV (the state’s official television channel) all but blacklisted the opposition parties in the run-up to the elections. Silencing the opposition in every conceivable way supports the parody of the democratic system in Algeria. Forty-four political parties, nearly half of which are brand new, and numerous independent candidates are vying to win the newly enlarged parliament’s 462 seats. Yet as Hadda Hazzam, a columnist for Algerian daily El-Fadjr, wrote, “The majority of the participating parties have neither platforms nor charismatic figures capable of promoting change or of creating a powerful opposition against the authorities.” Average citizens in Algeria are both overwhelmed with the number of unknown candidates and skeptical of the entire “democratic” process. The profusion of parties without tangible future plans, as well as a disconnect between the general populace and the leaders of the parties, all work in favor of ensuring the existing state of affairs and all of its associated fraud. Algeria’s 50th year of independence is this July. It has been 50 years of manipulation and exploitation by the government. Algeria’s rulers may have evaded the first wave of regional revolution, but it would be a fatal mistake for them to think they are now in the clear. Only genuine democratic reform and a rollback of the hogra-based system can deter more extreme approaches to change in the future. Cosmetic changes to the political system will only strengthen the hand of anti-democratic radicals. Algerians still do not identify with their leaders. According to El Watan, Algeria’s youth, who make up roughly three-quarters of the country’s 37 million inhabitants, planned on abstaining en masse in protest of the vote’s credibility. In order for the country to progress any further, there is a dire need to start by finally connecting the leaders and the masses. Despite the hype of reform, the latest election will not accomplish that goal.